A very interesting thing occurred the other day. I had just gotten home from work and realized that I had run out of dog food. Being tired, I went to Petco, strictly out of convenience. I normally do not shop there, especially for anything aquatic, but I was in a pinch. Upon entering the store, I of course went straight for the saltwater fish section just to see how things were. 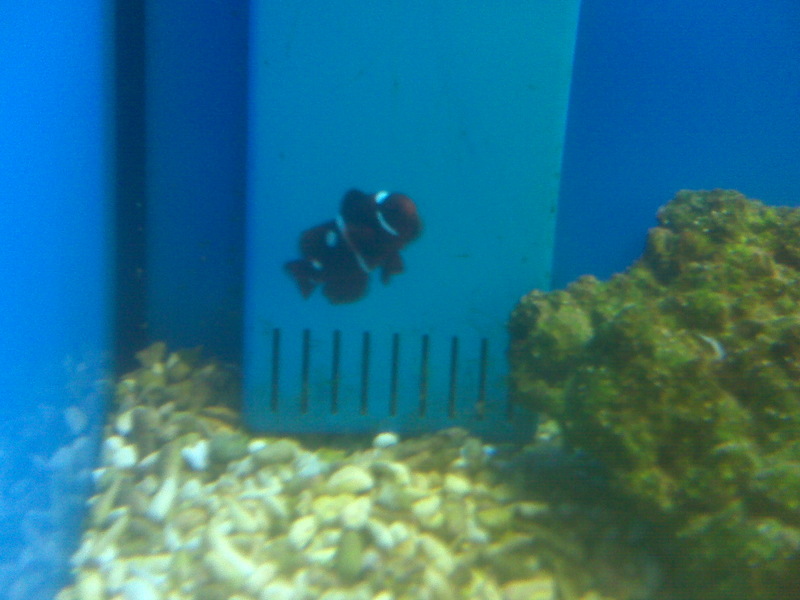 They had the typical clownfish and snails, but much to my surprise they also had one very unique looking Maroon Clownfish (Premnas biaculeatus). The clownfish had the typical vertical bars, but it also had a pair of white spots on one side. I snapped off of a terrible picture with my phone’s camera, but didn’t think anything else of the fish. I realize the clownish pictured below looks a lot like a black and white Ocellaris clownfish, but I promise it is a maroon clown. 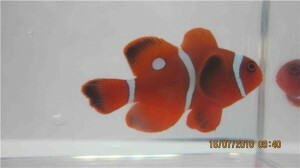 A few days later, I noticed a picture on the SEASMART Program’s Facebook Page that was an almost identical maroon clownfish. According to SEASMART, the clown they had pictured came from the same area that the Lightning Maroon Clownfish was taken from. Upon discovering the picture from SEASMART, I immediately went to my phone to double check the one picture I had. I knew the fish I saw was unique, but had no clue it could potentially be from the same area the Lightning Maroon Clown came from.